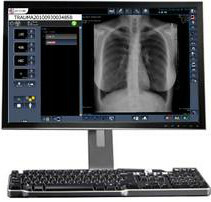 CPI RAD VISION TM software technology is full featured offering all the essential elements in an acquisition console for today’s integrated health market. Whatever the clinical scenario: RIS – non RIS; PACS – non PACS; Printing we have a solution for your unique set-up. There are no workflow disruptions from acquisition to archive. The process is Seamless! The acquisition workflow is organized with an easy-to-use uncluttered interface. Large button icons are designed to support touch screen capability. When a view is selected it is synchronized to generator controls. Each view represents a workable default start point. As views are acquired, preview images are rapidly replaced with enhanced images. One final click of the button archives the study – from start to finish the Radiographer’s speed is improved with fewer clicks. We recognized the difference between clinical environments, which is why we implement fully customizable protocols packages prior to shipment. System Administrators can easily from secured user accounts edit the APR database using an intuitive graphical protocol editor.